Earlier this year I met the creative team of Garden Tribe, Beth LaDove and Jen Long, two Bay Area creatives who have combined their love of gardening, documentary video and education to bring hands-on horticulture to life on the small screen. Sunset magazine singled out Garden Tribe as a “Best in the West” online find. I first learned of Garden Tribe when they debuted a workshop about designing and building “living arrangements,” taught by Baylor Chapman of Lila B. Design (and The 50 Mile Bouquet fame) at the San Francisco Flower & Garden Show. After some discussion, Jen and Beth asked me to develop some online floral content for their new site. We filmed on day in early June at the beautiful Oak Hill Farm in Sonoma, California. Today, thanks to Garden Tribe’s generosity, I am thrilled to share a “sneak peek” video clip to whet your appetite for the full workshop. Please enjoy “Eco-Friendly Floral Design – Quick Tips” (see above) and “Cutting Flowers” (below). You can find details about the full curriculum of workshops at GardenTribe.com. Jen Long (left) and Beth LaDove (right), creators of Garden Tribe. I was so impressed with their vision that I asked Beth and Jen to take part in a Q&A about their mission. Debra: Please introduce yourselves and explain your interest/passion for gardening? 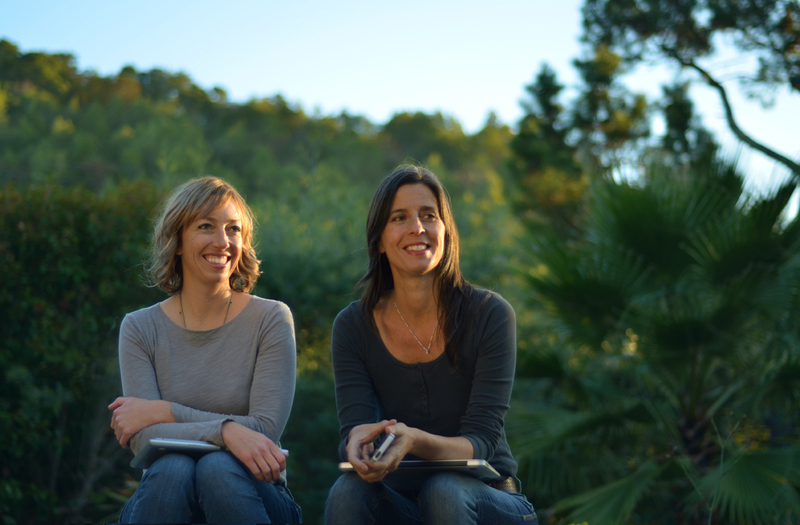 Beth & Jen: We are both lifelong gardeners and entrepreneurs. Beth comes from a long lineage of Italian food growers. Jen has never met a flower she didn’t want to grow. Between the two of us, we’ve probably been obsessed with just about every kind of garden and plant out there, at one time or another. Together, we have a shared passion for growing things. And these days, we are thrilled to be growing a business designed to give people a more joyful, meaningful experience of gardening. Debra: How did you come up with the idea to launch online video educational programming? Beth & Jen: We get questions all the time about how and when people should do things in their garden. The best way to answer those questions is by literally showing people what to do. We decided to create beautiful video classes that demonstrate real gardening, step-by-step. We also designed our classes to stream online, so that learning can happen anytime, anywhere. Debra: Why GARDEN TRIBE? It’s such a cute name! Beth & Jen: Gardening knowledge has always passed along in a tribal way–from person-to-person, out in the field. We named our company Garden Tribe because it honors how important it is to learn from each other, and cultivate our community. Debra: Who is your target audience? Beth & Jen: We know that all gardeners, from beginning to experienced, are looking for trustworthy information. That search often begins online, and the quality of that information greatly impacts the real world DIY experience. We’re providing curated, high-quality content for people who want to learn from top experts, so that their projects can get started right, the first time. Because our real goal is to get people where they most want to be: out in the garden and having fun. Debra: How many classes have you produced and what do you have cooked up in the future? As for future projects, we’re busy creating a new way for everyone on gardentribe.com to connect and share! Debra: Anything else you want people to know? Beth & Jen: We’re excited to be part of a growing movement that’s bringing the next generation into gardening. It’s so amazing to work with world-renowned experts (like you, Debra!) and share all that gardening knowledge online, around the globe. We’d love everyone to join our tribe, and share their questions, ideas and inspiration! Thanks to you both~ and thanks for sharing your passion with my tribe! This entry was posted on Sunday, September 7th, 2014 at 2:32 pm	and is filed under American Grown, Blog Posts, Creativity, floral design, General, Plants. You can follow any responses to this entry through the RSS 2.0 feed. You can leave a response, or trackback from your own site. Thanks so much for the lovely interview Debra! It was great working with you. Loved your video- a great concept for passing along your garden wisdom !! Great video and article. Almost time to start planning next year’s garden! Norm Brown´s last blog post ..Basics of Essential Oil.